Ethylene plays critical roles in plant growth and development, including the regulation of cell expansion, senescence, and the response to biotic and abiotic stresses. Elements of the initial signal transduction pathway have been determined, but we are still defining regulatory mechanisms by which the sensitivity of plants to ethylene is modulated. We report here that members of the ARGOS gene family of Arabidopsis, previously implicated in the regulation of plant growth and biomass, function as negative feedback regulators of ethylene signaling. Expression of all four members of the ARGOS family is induced by ethylene, but this induction is blocked in ethylene-insensitive mutants. The dose dependence for ethylene induction varies among the ARGOS family members, suggesting that they could modulate responses across a range of ethylene concentrations. GFP-fusions of ARGOS and ARL localize to the endoplasmic reticulum, the same subcellular location as the ethylene receptors and other initial components of the ethylene signaling pathway. Seedlings with increased expression of ARGOS family members exhibit reduced ethylene sensitivity based on physiological and molecular responses. These results support a model in which the ARGOS gene family functions as part of a negative feedback circuit to desensitize the plant to ethylene, thereby expanding the range of ethylene concentrations to which the plant can respond. These results also indicate that the effects of the ARGOS gene family on plant growth and biomass are mediated through effects on ethylene signal transduction. The gaseous hormone ethylene plays critical roles in plant growth and development, including the regulation of cell expansion, senescence, and the response to biotic and abiotic stresses . Key elements in the ethylene signaling pathway have been identified through the characterization of ethylene insensitive and constitutive ethylene response mutants of Arabidopsis, double mutant analysis then allowing for the ordering of these elements into a signaling pathway [2, 3]. These signaling elements are, in order, an ethylene receptor family related to the histidine kinases of prokaryotes, the Raf-like kinase CTR1, the Nramp-like protein EIN2, and the EIN3 family of transcription factors. This signal transduction pathway transduces the ethylene signal from the membrane-bound receptors to the nucleus, where the EIN3 transcription factors mediate the characteristic transcriptional response to ethylene. Interestingly, the ethylene receptors as well as the initial signaling elements in the pathway are predominantly localized to the endoplasmic reticulum (ER) . The ER is an unusual location for a hormone receptor but is compatible with the ready diffusion of ethylene in aqueous and lipid environments. The proximity of the receptors, CTR1, and EIN2 at the ER would facilitate transmission of the ethylene signal, which is thought to operate according to the following model. In the absence of ethylene, the receptors activate the Raf-like kinase CTR1 . The direct phosphorylation target of CTR1 is EIN2, which is maintained in an inactive state when phosphorylated by CTR1, thereby resulting in a suppression of the ethylene response [6–8]. Upon ethylene binding, the receptors inactivate CTR1, thereby relieving suppression on the downstream signaling elements. As a result, EIN2 is proteolytically processed such that a C-terminal domain is released to migrate to the nucleus, where it either directly or indirectly activates the transcription factors EIN3 and EIN3 like1 (EIL1) to initiate the transcriptional response to ethylene [6–8]. Arabidopsis seedlings can sense and respond to a tremendous range of ethylene concentrations, spanning over six orders of magnitude [9, 10]. Diverse mechanisms exist by which output from the ethylene signaling pathway can be modulated to regulate the plant’s ethylene sensitivity . These include transcriptional regulation and proteasome-mediated degradation of key signaling elements [12–17], clustering of receptors [18–20], and interactions of pathway elements with auxiliary proteins such as the RTE1/GR family [21, 22]. In addition, various genes have been identified as modulating the ethylene response based on a genetic screen for enhanced ethylene sensitivity [23–27]. We report here that the AUXIN REGULATED GENE INVOLVED IN ORGAN SIZE (ARGOS) gene family functions to regulate output by the ethylene signal transduction pathway. ARGOS is the founding member of a four-member family of proteins, and its expression, as indicated by its name, is induced by auxin . ARGOS is proposed to be a regulator of plant growth and biomass because overexpression increases organ size and antisense decreases organ size . Other members of this family (ARL, OSR1, and OSR2) yield similar mutant phenotypes [29–31], consistent with an overlapping function in the control of plant growth. As reported here, our data indicate that a primary function of the ARGOS family is to control ethylene signaling, with the ARGOS family members functioning as negative feedback mediators to desensitize the plant to ethylene, a role that facilitates the ethylene adaptation response of plants. This function in the regulation of ethylene signaling may itself account for the majority of the phenotypes associated with mutations in the ARGOS family. The primary success to date in identifying elements of the ethylene signal transduction pathway (e.g. ETR1, EIN2, CTR1, and EIN3) has come through the employment of genetic approaches [2, 3]. We pursued an alternative approach to identify new ethylene signaling elements, based on the hypothesis that many signaling pathways induce the production of negative regulators for the pathway, a precedent in the ethylene pathway being the negative regulator RTE1 . To this end, we examined microarray data for genes that are (1) induced by ethylene or the ethylene precursor 1-aminocyclopropane-1-carboxylic acid (ACC) and (2) encode proteins with predicted transmembrane domain(s), because these proteins could potentially be targeted to the endoplasmic reticulum where the initial signaling elements in the ethylene pathway are localized . By this process we identified members of the ARGOS family (ARGOS, ARL, and OSR1), which have been previously reported to regulate organ size, with OSR1 also identified as a gene induced in response to ACC [28–30]. The fourth member of the family (OSR2) is not present on the Affymetrix ATH1 genome array. The phylogenetic relationship between members of the ARGOS family is given in Additional file 1. All four members of the ARGOS family are induced by exogenous ethylene (Fig. 1a), but the dose dependence for ethylene-induction varies among the family members, induction of the closely related ARGOS and ARL being most sensitive to ethylene. Induction is blocked in the ethylene-insensitive mutants etr1-1 and ein2-1, and reduced in ein3;eil1 (which exhibits partial ethylene insensitivity) (Fig. 1b), demonstrating that expression is regulated through the well-characterized ethylene-signaling pathway [32, 33]. Time-course analysis indicated that both ARGOS and ARL are rapidly induced by ethylene, induction paralleling that of the ethylene receptor genes ETR2, ERS1, and ERS2 (Fig. 1c). To determine if the ethylene-induced changes in expression are reflected at the protein level we employed GFP-fusions to ARGOS and ARL driven from their native promoters (Fig. 2). In response to exogenous ethylene, both the ARGOS-GFP and ARL-GFP proteins are strongly induced, the level of induction being even greater than that observed for the transcripts (Fig. 2a). Upon removal of ethylene, transcript and protein levels for ARGOS-GFP and ARL-GFP rapidly drop, demonstrating tight control of expression by ethylene (Fig. 2b). Dose response analysis demonstrated that their protein induction is very responsive to ethylene, induction being detected in response to 0.001 μL L−1 ethylene (Fig. 2c). Public microarray data indicates that only ethylene (as the ethylene precursor ACC) and auxin (indole-3-acetic acid; IAA) consistently induce expression of ARGOS gene family members, ACC demonstrating a stronger effect than IAA (Additional file 2). Members of the ARGOS family were previously reported to be induced by auxin [28, 30]. However auxin stimulates ethylene biosynthesis [1, 34, 35], raising the possibility that the effect of auxin on the induction of ARGOS gene family members might operate indirectly through the ethylene signaling pathway. To test this hypothesis, we examined the effect the ethylene-insensitive mutant etr1-1 on the ability of auxin to induce expression of ARGOS, ARL, and OSR1 (Fig. 1d). Auxin (1-naphthaleneacetic acid; NAA) induced expression of all three genes, but this effect was eliminated by the ethylene-insensitive mutant etr1-1. These results indicate that auxin induction of the ARGOS gene family is dependent on the ethylene signaling pathway. Members of the ARGOS family contain two predicted transmembrane domains (Additional file 1). Prior analysis has suggested that members of the ARGOS family might be localized to nucleus, cytoplasm, plasma membrane and/or endoplasmic reticulum [28–31]. We found that the green-fluorescent protein (GFP) fusions of ARGOS and ARL are membrane-localized based on fractionation of transgenic plant lines into microsomal and soluble fractions (Fig. 3a). Furthermore, the fusion proteins are resistant to extraction from the membranes by sodium chloride, but can be solubilized from membranes when treated with the detergent lysophosphatidylcholine (Fig. 3b). In this respect, they are similar to the transmembrane ethylene-receptor ETR1 , consistent with ARGOS and ARL being transmembrane proteins. Although readily detectable by immunoblot analysis, we could not detect ARGOS-GFP and ARL-GFP based on their GFP fluorescence in these stable transgenic lines. Therefore, to determine the subcellular localization of ARGOS and ARL, we transiently expressed the GFP fusions in Arabidopsis protoplasts (Fig. 3c). The resulting fluorescence co-localized with the ER-marker BiP-RFP. Furthermore, the fluorescence in the region underlying the plasma membrane exhibited the distinctive reticulate network appearance found with the cortical ER (Fig. 3c). No localization to the plasma membrane itself was detected. Thus, both the co-localization with BiP and morphological features of the membrane network support ER localization for ARGOS and ARL, consistent with results reported by Feng et al. .
We found that the ARGOS:ARGOS-GFP and ARL:ARL-GFP lines affected ethylene sensitivity based on the growth response of dark-grown seedlings to ethylene. Wild-type seedlings exhibit a pronounced reduction in hypocotyl growth when grown in 1 μL L−1 ethylene (Fig. 4B, C). Dose response analysis indicated that both the ARGOS:ARGOS-GFP and ARL:ARL-GFP exhibit reduced ethylene sensitivity (p < 0.05) compared to wild type at concentrations ranging from 0.01 to 100 μL L−1 ethylene (Fig. 4c). Since the ARGOS:ARGOS-GFP and ARL:ARL-GFP transgenes are expressed in the wild-type background, ethylene treatment will result in an overall heightened level of ARGOS family expression compared to wild type due to the presence of the native gene and the transgene. These data indicate that ARGOS and ARL can function as negative regulators of the ethylene response. Furthermore, the finding that such a phenotype can be induced from the native promoter is suggestive that changes in expression levels of ARGOS and ARL normally regulate ethylene sensitivity. We tested the hypothesis that ARGOS and ARL function as negative regulators by generating transgenic lines overexpressing these genes under the constitutive CaMV 35S promoter. Overexpression lines exhibited increased basal expression of ARGOS or ARL in the absence of ethylene, and resulted in higher than wild-type expression in the presence of ethylene (Fig. 4a). The ethylene sensitivity of the ARGOS and ARL overexpression lines was significantly reduced compared to wild-type based on the dark-grown hypocotyl growth response to 1 μL L−1 ethylene (Fig. 4b). For comparison in this analysis, we also included the ethylene-insensitive mutant etr1-1 which lacks this hypocotyl growth response to ethylene [33, 37], and the constitutive ethylene-response mutant ctr1-2 which displays reduced hypocotyl growth in the both the absence and presence of ethylene (Fig. 4b). Dose response analysis demonstrating reduced sensitivity (p < 0.05) of the ARGOS and ARL overexpression lines compared to wild type from 0.01 to 100 μL L−1 ethylene (Fig. 4c). A defining characteristic for ARGOS family mutants is their effect on plant biomass, their overexpression resulting in increased leaf area, these effects being attributed to changes in cell expansion and/or cell proliferation [28–31]. Ethylene insensitivity results in a similar increase in leaf area [32, 37, 38], suggestive that effects of ARGOS-family overexpression on biomass could be due to altered ethylene signaling. To assess the role of the ethylene signal-transduction pathway in regulating cell expansion and cell proliferation, we characterized fully expanded leaves of the ethylene-insensitive mutant etr1-1  and the constitutive ethylene-response mutant ctr1-2 . As shown in Fig. 5, ethylene insensitivity results in increased leaf area due to an increase in both cell size and cell number. Conversely, the reduced leaf area found in ctr1-2 arises from a decrease in both cell size and cell number. Overexpression of ARGOS or ARL results in increased leaf area, consistent with prior studies [28, 30], this change being due to a significant increase in both cell expansion and cell proliferation (Fig. 5). Thus the changes in leaf area arising from altered expression of the ARGOS family are consistent with what is observed in mutants that affect ethylene signaling. To gain information at the molecular level as to how the ethylene response differs between wild type and the ARGOS-family overexpression lines, we examined ethylene-dependent gene expression (Fig. 6a). RNA was prepared from seedlings grown in the dark in the absence or presence of 1 μL L−1 ethylene, because we observed substantial differences in the hypocotyl growth response under these conditions (Fig. 4b, c). Five reporter genes we previously identified as robustly induced by ethylene [10, 39], were all induced in the wild-type seedlings (Fig. 6a). The molecular response to ethylene was altered in the 35S::ARGOS and 35S::ARL lines (Fig. 6a). First, the basal expression of the reporter genes was reduced compared to wild type, indicating a reduced response to endogenous ethylene in the 35S::ARGOS and 35S::ARL lines. Second, the expression level of the reporter genes in response to 1 μL L−1 ethylene was also reduced in the transgenic lines compared to wild type. Thus overall, we observed consistently reduced expression for the reporter genes in the 35S::ARGOS and 35S::ARL lines. We also examined the molecular response for four genes whose expression is repressed in response to 1 μL L−1 ethylene in wild type (Fig. 6a) . Effects of the transgenic lines on the ethylene-repressed genes were less consistent than on the set of ethylene-induced genes. However, notably, the basal expression levels for both KIN2 and CHS were significantly higher in the 35S::ARGOS and 35S::ARL lines (Fig. 6a), consistent with the response to endogenous ethylene in these lines being compromised such that they no longer suppress expression of these genes effectively. As an alternative approach to examine the ability of ARGOS family members to inhibit ethylene-dependent gene expression, we employed a transient protoplast assay with the ethylene-inducible luciferase reporters ERF1-LUC or GCC-LUC [40–42]. Treatment of protoplasts with ethylene induces expression of the luciferase reporters (Fig. 6B). However, co-transfection with either ARGOS or ARL reduces the responsiveness of the luciferase reporter to the exogenous ethylene treatment. The basal level of expression for the luciferase reporter is also reduced, indicating that expression of ARGOS or ARL reduces the response to endogenous ethylene. Overall, these molecular results reveal that the ARGOS family members function as negative regulators of the ethylene-signaling pathway. We used time-lapse imaging to examine the growth inhibition kinetics of hypocotyls from two-day-old, dark-grown Arabidopsis seedlings. We have previously shown that application of higher concentrations of ethylene (>1 μL L−1) to wild-type Arabidopsis seedlings results in a rapid reduction in growth rate approximately 10 min after application of ethylene, with seedlings reaching a new steady state growth rate approximately 75 min after ethylene addition [9, 12]. Application of 0.1 μL L−1 ethylene causes growth inhibition with kinetics that are initially indistinguishable from higher dosages . However, approximately 2.5 h after 0.1 μL L−1 ethylene application, desensitization is observed where the growth rate increases to a new steady-state rate approximately 50 % of that observed in air . We obtained similar results with wild-type seedlings in the current study (Fig. 7). Overexpression of either ARGOS or ARL resulted in seedlings that initiated desensitization with a shorter delay and which reached a higher growth rate than wild-type seedlings (Fig. 7, Table 1). These results indicate that changes in expression of ARGOS family members modulate the seedling desensitization response to ethylene. Our results indicate that a key physiological role of the ARGOS family is to desensitize plants to ethylene. Desensitization is a common feature of sensory systems and is, for example, incorporated into such diverse systems as bacterial chemosensing, yeast osmosensing, and mammalian olfactory and light sensing . Desensitization (or adaptation) is typified by the sensitivity to a signal being altered in response to changes in the level of the signal, thereby allowing the organism to sense the signal over as wide a range as possible. Arabidopsis can sense changes in ethylene concentration over six orders of magnitude [9, 10], consistent with a desensitization response. Short-term analysis of ethylene growth kinetics previously demonstrated that seedlings exhibit a desensitization response when treated with 0.01 μL L−1 ethylene, the timing of the response being consistent with the transcriptional induction of a negative regulator such as the ARGOS gene family , our data demonstrating that altered expression of ARGOS family members perturbs this desensitization response. Differing induction kinetics suggests that members of the ARGOS family could modulate the desensitization response across a range of ethylene concentrations. Ethylene induction of the ARGOS gene family is likely to be a primary ethylene response based on the presence of binding sites for the transcription factor EIN3 in the promoters of ARGOS, ARL, and OSR2 . Additional mechanisms that may allow for desensitization of the ethylene response have been identified. As with the ARGOS family, these involve transcriptional induction by ethylene of negative regulators. First, the ethylene receptors are negative regulators and several members are induced by ethylene (ERS1, ETR2, and ERS2 in Arabidopsis), such induction being observed in dicots and monocots [12, 45]. Second, members of the RTE1/GR family are also negative regulators of ethylene signaling [21, 22]. RTE1 is an ethylene-inducible transmembrane protein that interacts with the ethylene receptor ETR1 and appears to stabilize the receptor in the conformation normally observed in the absence of ethylene, thereby decreasing the receptor’s sensitivity to ethylene [22, 46, 47]. Third, acting to control the level of transcriptional output, the F-box protein EBF2 is an ethylene-induced negative regulator that targets the EIN3/EIL family of transcription factors for degradation [16, 48]. Fourth, transcriptional repressors of the ERF family are induced by ethylene and feedback to down-regulate the ethylene transcriptional response [49, 50]. Interestingly, co-expression analysis places ARGOS, ARL, and OSR1 in a network involving genes for the ethylene receptors ERS1 and ETR2 as well as for the F-box protein EBF2 , consistent with a role in regulating the ethylene response. The range of mechanisms for desensitization would allow for concerted regulation of ethylene responses from receptor to gene expression, and also provide multiple points for cross-talk with other pathways. The mechanism by which the ARGOS family regulates ethylene signaling remains to be elucidated, but several predictions can be made. First, the mechanism is likely to involve the transmembrane portion of the ARGOS family proteins, the two transmembrane domains and the proline-rich linker joining them exhibiting the greatest sequence conservation, deletion analysis confirming that this region is sufficient to induce organ growth when overexpressed . Second, the effect of the ARGOS family is likely to involve initial components of the ethylene signaling pathway based on their co-localization to the ER . Third, the ARGOS family is likely to regulate signal output from a primary rather than a peripheral element of the pathway, because modulation of ARGOS family expression has broad effects on the physiological and molecular response to ethylene. Based on these characteristics, the ethylene receptors and EIN2 represent potential targets for regulation by the ARGOS family. Based on our analysis, the previously described effects of ARGOS family mutants on plant biomass, occurring due to alterations in cell expansion and proliferation [28–30], can be ascribed to a role in modulation of the ethylene signaling pathway. Ethylene mutants are known to affect plant growth, ethylene insensitivity resulting in increased plant biomass [37, 51, 52], enhancement of ethylene signaling resulting in decreased biomass [5, 53]. Indeed, approaches to inhibit ethylene signaling have been pursued as a means to increase plant biomass under common environmental-stress conditions [54, 55]. Our results making use of ethylene pathway mutants support a role for ethylene in regulation of both cell expansion and proliferation in Arabidopsis leaves, these effects both contributing to changes in biomass, consistent with the effects we observed in ARGOS family mutants. We note that prior characterization of ARGOS-family overexpression lines indicated effects on cell proliferation for ARGOS , cell expansion for ARL and OSR2 [30, 31], and both for OSR1 . Our results indicate that ARGOS and ARL, like OSR1, regulate both cell expansion and proliferation. Differences in ascribing roles in cell proliferation and/or expansion can arise due to such factors as to the leaf chosen for analysis and whether the leaf has reached full expansion, prior interpretation for the effects of ethylene mutants on leaf area having differed due to such variables [37, 56]. The ARGOS family is plant-specific and the role it plays in modulating plant biomass has led to its characterization in other plant species, including the dicot cabbage and the monocots rice and maize. Overexpression of an ARGOS homologue from cabbage (BrARGOS) in Arabidopsis resulted in increased organ growth, with an increase in leaf area arising primarily due to an increase in cell proliferation . Similarly, overexpression of the rice homologue OsARGOS in Arabidopsis also resulted in increased organ growth, although here the increase in leaf area was attributed to effects on both cell proliferation and expansion . Interestingly, no effects on organ size were found when OsARGOS was overexpressed in rice. However the effects of ethylene insensitivity on the adult rice phenotypes examined are subtle  and so the lack of a phenotype is consistent with what might be expected based on a role for OsARGOS in ethylene signaling. It will be of interest to determine if the transgenic rice lines have altered ethylene-related phenotypes for root and coleoptile growth, senescence, and grain weight per plant. The maize homologue to ARGOS (ZmZAR1) has also been characterized, its transgenic overexpression in maize resulting in increased plant and organ growth, including that of leaves, stalks, and ears . Increased leaf area of the ZmZAR1 overexpressing lines was primarily due to an increase in cell proliferation rather than cell expansion. Overexpression of ZmZAR1 was also implicated in an enhanced resistance to drought stress, a phenotype that could relate to a role in ethylene signaling because a reduction in ethylene activity enhances drought tolerance in maize . Of interest is our finding that ethylene pathway mutants affect cell proliferation as well as cell expansion. Although the role of ethylene as an inhibitor of cell expansion is well documented in Arabidopsis, a role for ethylene in the control of cell proliferation is more novel. However, earlier data from agronomic plant species as well as recent data from Arabidopsis support an inhibitory role for ethylene in cell division [1, 62]. In particular, treatment of Arabidopsis seedlings with the ethylene precursor ACC inhibited cell proliferation in leaves as well as activity of cyclin-dependent kinase A . Our analysis of ethylene-pathway mutants is consistent with an inhibitory role for ethylene in the regulation of cell proliferation. The five-fold difference in leaf cell number we observe between the ethylene-insensitive mutant etr1-1 and the constitutive ethylene response mutant ctr1-2 support a substantive contribution of ethylene to the regulation of cell proliferation. We demonstrate a new role for the ARGOS gene family in negatively regulating the ethylene response of Arabidopsis. A model integrating the ARGOS family with the ethylene signaling pathway is shown in Fig. 8. Members of the ARGOS family are transcriptionally induced in response to ethylene, induction requiring signaling through the primary ethylene signaling pathway. ARGOS and ARL are targeted to the endoplasmic reticulum, the same subcellular location as initial signaling elements in the ethylene pathway. Consistent with their role as negative regulators of the ethylene pathway are the effects of overexpression lines on (1) the triple response of dark-grown seedlings to ethylene, (2) the short-term kinetic response to ethylene, (3) cell expansion and proliferation in leaves, and (4) ethylene-dependent gene expression. Together these data support a model in which the ARGOS gene family functions as part of a negative feedback circuit to desensitize the plant to ethylene, thereby expanding the range of ethylene concentrations to which the plant can respond. These results also indicate that the effects of the ARGOS gene family on plant growth and biomass are mediated through effects on ethylene signal transduction. To make constructs for expression of ARGOS (At3g59900) and ARL (At2g44080) with C-terminal GFP tags and driven under their native promoters, genomic fragments including 5′ flanking regions (1640 bp and 1479 bp for ARGOS and ARL, respectively) and coding regions (390 bp and 405 bp for ARGOS and ARL, respectively) were amplified from wild-type Col-0 genomic DNA, using the ARGOS primers 5′-TGGTCAACGATTCAAGGAGATCCA-3′ and 5′-GCCGATTGACATGAAATTGCAAGTTACATCTG-3′, and the ARL primers 5′-TAGCCACCACATGAAATGCCGAGA-3′ and 5′-GCCGATTGACATGAAATTGCAAGTTACATCTG-3′. Fragments were cloned into the entry vector pCR8 (Invitrogen, USA) and then recombined into the vector pGWB204  using the Gateway system. For overexpression of ARGOS and ARL in plants and protoplasts, their coding regions were amplified from cDNA, with ARGOS amplified using the primers 5′-GAATCCATGATTCGAGAAATCTCAAACTTAC-3′ and 5′-GGATCCTGACATGAAATTGCAAGTTACATCTG-3′ and ARL amplified using the primers 5′-GAATCATGATTCGTGAGTTCTCCAGTCTAC-3′ and 5′-GGATCCCATAAAAGTGGAAGAAGAAGAAACATG-3′, and the fragments cloned into pCR8. The fragments were moved into pEarleyGate100  for stable plant transformation and into CsVGFP-999  for protoplast transfection. For plant transformation, constructs were introduced into Agrobacterium tumefaciens strain GV3101 and transformed into Arabidopsis by the floral-dip method . Arabidopsis protoplasts were isolated and transfected as described . Visualization for localization studies was with a Leica TCS SP UV confocal microscope, GFP being imaged with a 488 nm laser, RFP with a 561 nm laser, and protoplasts with DIC optics. For analysis of the ethylene response, the reporter constructs GCC-LUC  and ERF1-LUC  were used. The UBQ10-GUS construct was used as an internal control. Transfected protoplast samples in culture dishes were placed in air-tight containers with or without 10 μL L−1 ethylene for 6 h at 22 °C under dim light (5 μE⋅m−2⋅s−1). The results are shown as the means of relative LUC activities from duplicate samples with error bars. Microsomal and soluble fractions were isolated from green Arabidopsis seedlings as described . Briefly, plant material was homogenized in 30 mM Tris (pH 8), 150 mM NaCl, 10 mM EDTA, and 20 % (v/v) glycerol, with protease inhibitors cocktail (Sigma) and then centrifuged at 8,000 g for 15 min. The supernatant was then centrifuged at 100,000 g for 30 min, and the resulting membrane pellet was resuspended in 10 mM Tris (pH 7.6), 150 mM NaCl, 1 mM EDTA, and 10 % (v/v) glycerol with protease inhibitors cocktail. Immunoblot analysis was performed as described . The BCA assay (Pierce) was used to measure protein concentration as described . Before SDS-PAGE, protein samples were mixed with SDS-PAGE loading buffer and incubated at 37 °C for 1 h to denature integral membrane proteins without aggregation. Primary antibodies used were HRP-conjugated monoclonal anti-GFP (Santa Cruz Biotechnology), anti-ETR1 , anti-BIP (Stressgen Biotech), and anti-ACC oxidase (Santra Cruz Biotechnology). For short-term ethylene treatment of green seedlings, seedlings were grown at 22 °C for two to three weeks with constant light on Murashige and Skoog basal medium with Gamborg’s vitamins (pH 5.75; Sigma), 1 % (w/v) sucrose and 8 % (w/v) agar , then treated for the indicated times and ethylene concentrations in sealed containers. Treatment and analysis of the triple response of dark-grown Arabidopsis seedlings to ethylene was performed as described . Aminoethoxyvinylglycine (AVG; 5 μM), an inhibitor of ethylene biosynthesis, was included in the media to reduce endogenous ethylene production. For short-term kinetic analysis of dark-grown seedlings, time-lapse imaging and growth rate analysis of hypocotyls were carried out as previously described [9, 12]. To determine leaf size, cell area, and cells per leaf of ethylene pathway mutants compared to ARGOS family mutants, the fully expanded fifth leaf was analyzed from 30-day-old plants grown under an 18-h light/6-h dark cycle. Cell area was determined from palisade cells at the central region of the leaf beside the mid-vein as described , with 10 palisade cells characterized per leaf. Area determination measurements were made with IMAGE J software (http://rsbweb.nih.gov/ij/). ANOVA tables were generated using http://www.physics.csbsju.edu/stats/anova.html and multiple comparison tests done using http://graphpad.com/quickcalcs/posttest1/ quick calc web tool that uses the Bonferroni correction for post-test comparisons. Muneeza Iqbal Rai, Xiaomin Wang and Derek M. Thibault contributed equally to this work. We thank Nick Weir for assistance in the initial characterization of mutants and Ian Street for assistance in statistical analysis. This work was supported by grants from the Division of Chemical Sciences, Geosciences, and Biosciences, Office of Basic Energy Sciences of the U. S. Department of Energy (DE-FG02- 05ER15704) and the National Science Foundation (IOS-1022053) to GES, from the National Science Foundation (MCB-0918430 and IOS-1254423) to BMB, the Human Frontier Science Program (LT000757/2009-L) to HJK, and the International Research Support Initiative Program of Higher Education Commission of Pakistan to MIR. Additional file 1: Characteristics of the ARGOS family. 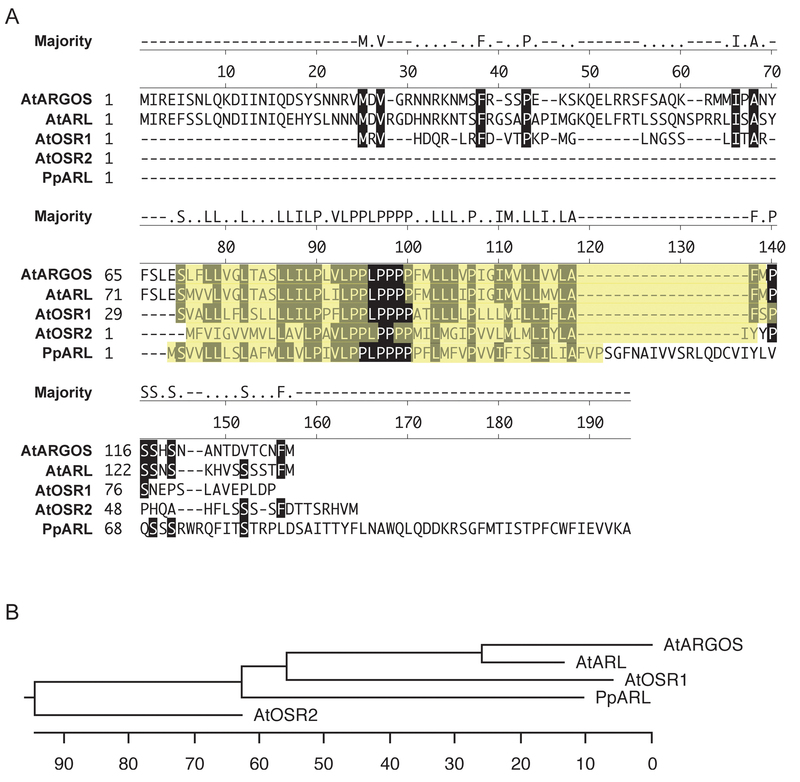 Arabidopsis contains a four-member gene family encoding AtARGOS, AtARL, AtOSR1, and AtOSR2. The moss Physcomitrella patens has a gene encoding a related protein (PpARL). At indicates Arabidopsis; Pp indicates Physcomitrella patens. (A) Amino acid sequence alignment. Two predicted transmembrane domains are highlighted in yellow. Residues identical to the consensus (Majority) are highlighted. Note the highly conserved proline-rich region at the turn between the two predicted transmembrane domains. Clustal alignment was performed on the multiple sequences using the Lasergene MegAlign program (DNASTAR, Inc.). (B) Phylogenetic relationship derived from the multiple sequence alignment. Units indicate number of substitution events. Additional file 2: Hormonal induction of the ARGOS gene family based on microarray analysis. 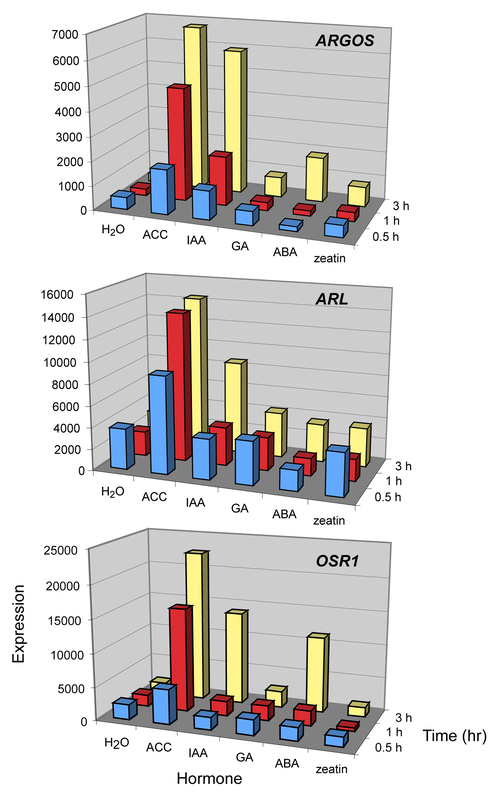 Three-dimensional graphs are shown for expression of ARGOS, ARL, and OSR1, with hormone treatment on the X-axis, relative expression on the Y-axis, and time on the Z-axis. Data was extracted from AtGEnExpress using the Weigelworld interface (http://www.weigelworld.org/resources/microarray/AtGenExpress) for green seedlings treated for 0.5 (blue), 1 (red), and 3 (yellow) hours with a water control (H2O), the ethylene biosynthetic precursor aminocyclopropane-carboxylic acid (ACC), auxin (IAA), gibberellic acid (GA), abscisic acid (ABA), and cytokinin (zeatin). MIR performed molecular and physiological analyses on wild type and transgenic lines. XW helped generate transgenic lines and characterized wild type and transgenic plants. DMT helped generate transgenic lines and characterized wild type and transgenic plants. HJK performed the transient protoplast assay. MMB assisted in cloning and analysis of ethylene regulation of ARGOS family genes in wild type. BMB performed the kinetic analysis and helped draft the manuscript. SS participated in the design and coordination of the study. GES conceived of the study, participated in its design and coordination, and drafted the manuscript in concert with the other co-authors. All authors read and approved the final manuscript.